Austin has some great musical talent. I have been fortunate enough to take in some of the best the city has to offer. (200kb file, pdf format) Clifford Antone, a giant presence that was instrumental in turning Austin into a blues mecca and live music capital passed away May 23, 2006. I had the great privilege to visit his Antone's Club, termed 'Austin's Home of the Blues' a number of times, and was musically enriched for doing so. The photo at left was taken by me December 29, 1998 at his club on the corner of 5th and Lavaca streets. Austin blues legend Lou Ann Barton and me mugging at Antone's (aka Autin's Home of The Blues), Austin, Texas, late 1998. Cover from an early Lou Ann Barton CD. Dig those long legs! Don't miss photos of Jimmie Vaughan and his Tilt-A-Whirl Band along with Lou Ann Barton doing their 2004 tour! Stevie Ray Vaughan tribute statue, Auditorium Shores, Town Lake, Austin, Texas. The Austin live music scene is not complete without mention of the great influence the Vaughan Brothers have had. Stevie Ray Vaughan, played a searing guitar, and to this day influences aspiring Austin music wannabes. Although Stevie Ray left this world way too soon, older brother Jimmie carries on the Vaughan name, delighting audiences worldwide. 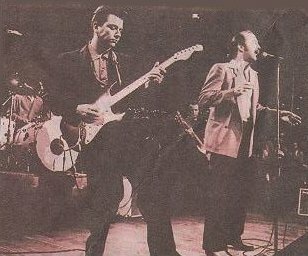 Jimmie Vaughan and Kim Wilson shown during the prime of the Fabulous Thunderbirds in 1985. 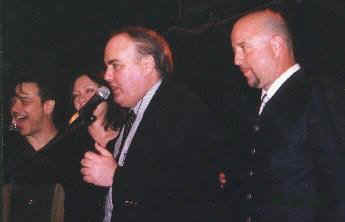 3 blues greats--Jimmie Vaughan, Lou Ann Barton, Kim Wilson, and blues impresario, Clifford Antone (center), at a memorable December 29, 1998 performance at Antone's namesake blues club. 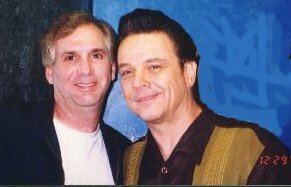 Jimmie Vaughan & Me--Antone's Jimmie V. & Drummer Great George Rains play Antone's Kim Wilson, ex. Fabulous Thunderbirds band member and me. Jimmie V. "at work"
Another offshoot of the Vaughan influence was Storyville. This highly thought of Austin outfit included Stevie Ray's former Double Trouble bass player Tommy Shannon, and drummer, Chris Layton. David Holt, and David Grissom were experienced hands in their own right, but the singing star that emerged, was Malford Milligan, a performer grounded in gospel music. Unfortunately the group disbanded in early 1999, but will certainly be remembered as a bright footnote in the annals of Austin music history. Storyville outside the famous Continental Club, in south Austin (l-r) David Holt, David Grissom, Malford Milligan, Chris Layton, Tommy Shannon--of Storyville. A popular Austin group that released only one album is the Electromagnets featuring the powerful guitar of Eric Johnson. Nearly 24 years after the album was cut, they showed up at Austin's famed Waterloo Records to sign autographs and schmooze with fans from days past. Of course no Austin music experience is complete without mentioning the maestro of "old time Texas music," the great--Don Walser! Check out my tribute page with many more additional pictures of Don. Also, don't miss my Freddy Fender and Doug Sahm tribute page. Blues guitarist-singer Sue Foley Former Small Faces great Ian McLagan, who often played Austin's Saxon Pub. Blues impresario Clifford Antone Austin blues legend Lou Ann Barton. Obtained after a performance at Speakeasy. Toni Price Champ Hood, one of the finest fiddlers I have ever heard. Mike Keller was one of Austin's young aspiring blues guitar players.